Like me you would have fond memories of hearing pirate stations from yesteryear. This is an absolutely wonderful special that we hope will gain enough momentum to be audible across the world on shortwave by none other that shortwave pirate stations. We haven't entered into North American shores yet so are on the lookout for a relay. Statistics: 3/Feb/15 495 listeners, 135 downloads. So the American relay was a shock, I have now been informed our show also featured on WBCQ Allan Weiner Worldwide into USA. While we have not had correspondence from WBCQ we do fully thank them for their efforts and hope this may bridge a new relay partner. 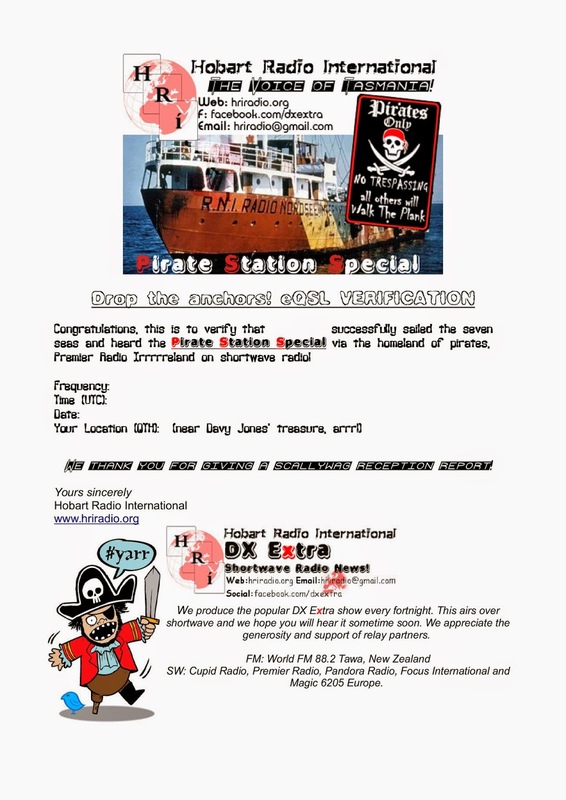 We will offer a special electronic (eQSL) reception report if you hear the pirate station special on shortwave. Sometimes stations relay us without informing us, so if you hear the broadcast and have an idea who the relay is please include your hunch. The below blank eQSL could have your name on it! One listener has put one they got on their blog. In fact many hobbyist blogs are filling up with these special eQSLs! Thanks to Klaus for his publication and promotion on the VoDX blog. Ahoy and Welcome to the Pirate Station Special. If you are into the shortwave hobby you will know that there are vast things to hear, from number stations, aircraft, amateurs, cladenstine stations and of course pirate stations as well. Sit back and relax as Andrew Yoder on coast to coast AM with Art Bell explains how pirate broadcasting works. We'll be back soon. Kracker Radio is a station that you can call pretty artistic for the fact that whoever it was back in 2005 could produce such variety in shows. Kracker is also known as CB Savage In 2007 a station took America by storm, scaring many into thinking a bunny revolution was coming, (not really) WBNY “Radio Bunny – Voice of Rodent Revolution” appeared on air sounding like a number station. It was however revealed that Kracker was linked with that station. A new oddity to the pirate scene is the Bangalore Poacher. This seems to follow on from WBNY providing an Indian accent with numbers read out, the Lincolnshire Poacher number station interval signal and ads and random utterings. Sure is an odd but hilarious station worth the entertainment value. Possibly from the Toronto area using 25 watts. Enjoy the insurance ads! This is exactly what makes listening to pirate radio so fun! Borderhunter Radio has been around for some time now, playing techno from the Netherlands. Here's one that didn't hang around too long, Take it Easy Radio from 2004 on 6925USB. The question I wonder is if pirate radio is really a bad thing. As many International broadcasters abandon short wave there won't be as much left for listeners and if you are after music, entertainment and something a bit more than just news you don't have many options on shortwave except for listening to pirates. “KIPM - Illuminati Prima Materia, was a shortwave radio pirate active from the early to mid 2000's. The host, Alan Maxwell, produced long, elaborate shows that featured dramatic, literate story lines, often with elements of science fiction woven in. Story lines employed spooky twists and elements akin to the 1960's TV broadcasts of The Outer Limits and The Twilight Zone. Common themes included alien encounters from other worlds and deep insight into the inner human mind. Maxwell produced and broadcast 34 shows using homemade equipment of elaborate design and has a unique sound style. The talents of many contributors, actors and musicians were integral to these stories. Broadcasts would take place on random nights of the year, usually holidays, running the entire night eluding discovery by the Federal Communications Commission while radiating massive amount of transmitted power. Archive.org <- you can listen and download the entire KIPM studio quality series. Another station that became quite famous in the 1970s would be the Europe offshore radio station run by Mebo Communications, a Swiss firm. “This station, RNI, was to have a troubled and controversial life. The ship was violently attacked twice, its output was jammed by the governments of two European countries and there were numerous allegations about the source of its funding and its reasons for broadcasting. We may never know the whole truth about RNI but the station won a large and loyal audience across the continent who, forty years on, still remember its programmes with great affection.” The Pirate Radio Hall of Fame <- the whole story. The station made many enemies as Medium Wave signals interfered with emergency services and then when moving to a new frequency interfered with Dutch national radio. The British Post Office who controlled the airwaves also started jamming the station making it difficult to hear in England. On the 31st of August 1974 at 6pm Radio Veronica closed down. At 7pm Radio Atlantis followed suit and an hour later, at 8pm, both services of RNI ended transmissions. The station had closed before, back in 1970, but this time it really was the end for Radio Northsea International. Welcome back to the pirate station special here on Hobart Radio International. Just a reminder that you can send a reception report for electronic QSL verification to hriradio at gmail dot com. I am sad to say we are very close to finishing the show and I still feel there is so much more to the pirate world. I still have many more recordings in the archive and I can't leave without sharing some more. So, to end I have created a mix, a mish-mash if you like of other pirate radio stations. Thank you for listening in, I hope you enjoyed the show and keep an eye out for us on shortwave with more exciting programs and of course we are on the internet at hriradio dot org. See ya!